Last day in Syria. 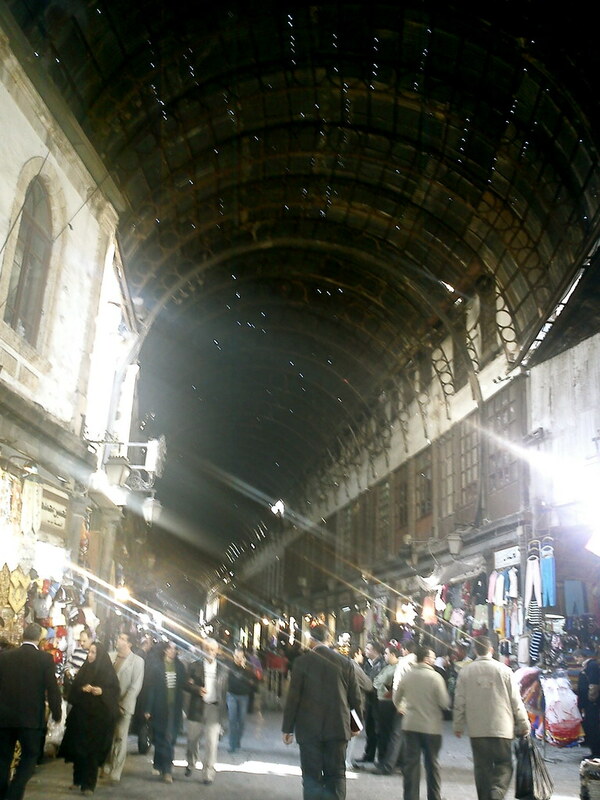 My flight was in the evening, so I had a full day ahead, which I decided to spend exploring Damascus a little more. 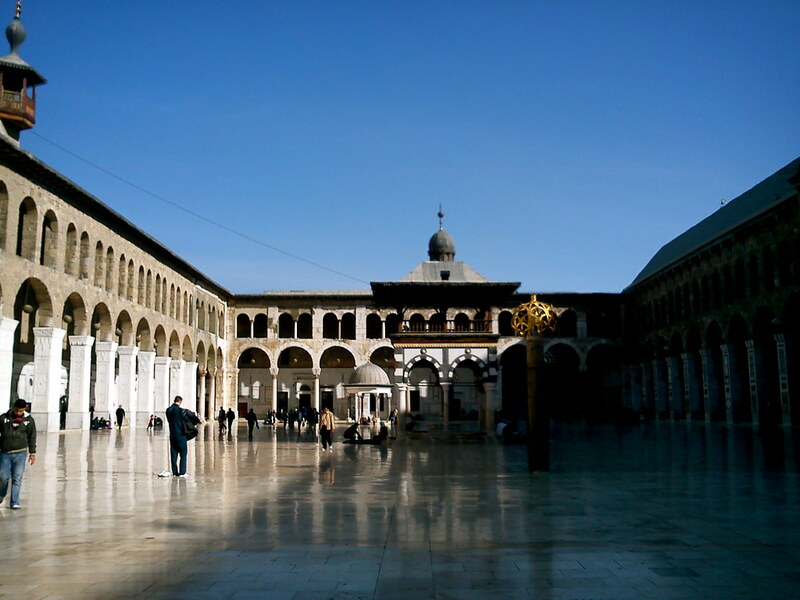 I definitely wanted to go inside the Umayyad Mosque, and visit the grave of Saladin inside the mosque. At 11-ish am, I started the trek across town to the Muslim quarter (yes, I’m not an early riser. Gone are the days when I was 19, and was so excited on travels I’d leave the guesthouse at first light). It was a pleasant walk as usual, as it brought me through the souqs, and I also saw some bits of interesting architecture. One particularly interesting building that I went by was the Khan Asad Basha, which was apparently built so that merchants have a safe place to stay, and to exchange their goods (http://archnet.org/library/sites/one-site.jsp?site_id=6987). I found the entrance really striking – the last time I saw this type of architecture, it was back in Iran. 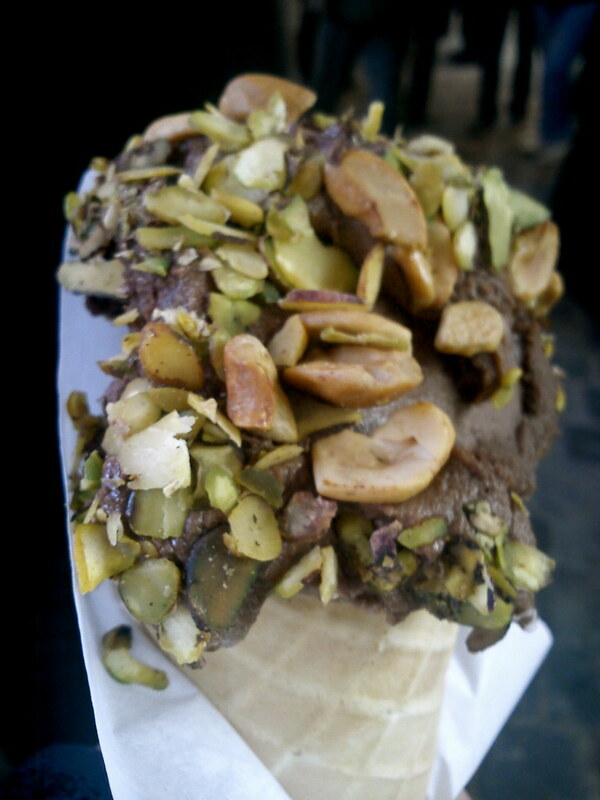 Walking towards the Umayyad Mosque made me kinda peckish, and when I walked through the Grand Bazaar, and saw many people holding ice creams coated with pistachios, I knew I had to have that. I can never say no to ice cream. 😛 So, I walked into Bakdash Sweets, joined the line of people waiting for their ice creams, and left a very, very happy customer. After chomping down my ice cream (50 SP), I proceeded to take the short walk to Umayyad Mosque, and paid the 50 SP entrance. They give you a full body cover, so that you will be respecting the dress code of entering this sacred site. Right after you leave the luggage/clothing room in the west entrance, you’ll walk by the Mausoleum of Saladin. Saladin was the great anti-crusader, who was not extremely successful, but he was also known for his chivalry. Hence, he was admired by his followers, but also respected by his enemies. No small feat, I say! I’m just glad for the opportunity of being in the final resting place of such a great man. 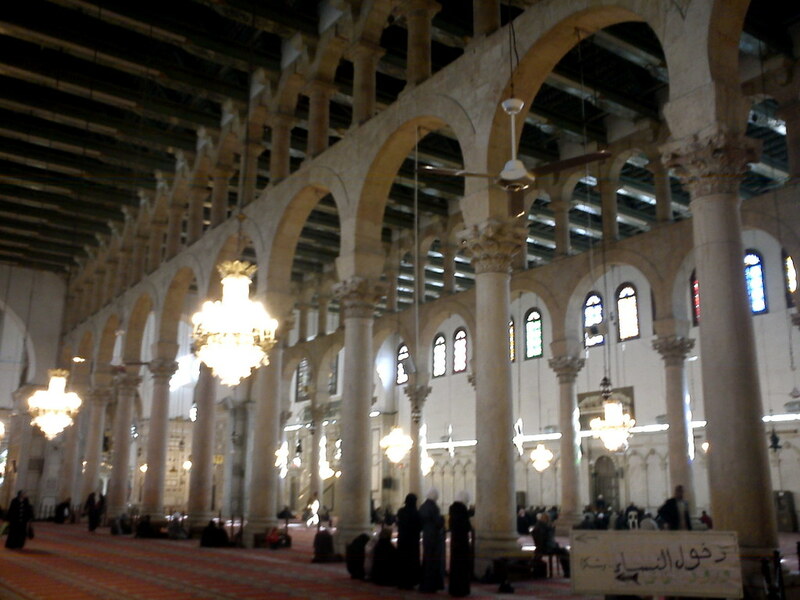 Finally, I entered the Umayyad Mosque. 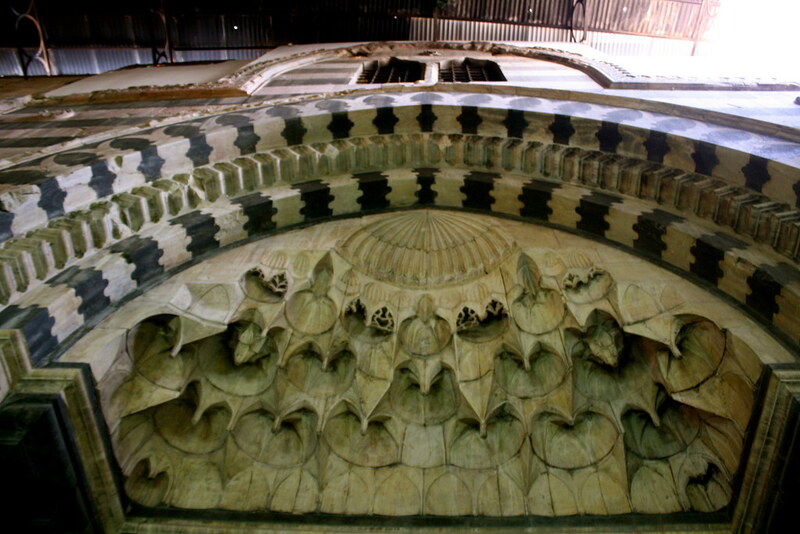 It used to be a Christian basilica, but has since then become a mosque. honestly, I can’t quite tell the changes, but it was HUGE. I think I just spent my time gaping at the high ceilings. It was evidently a site of pilgrimage. I saw many groups of religious tourists from other countries, sitting in a group and praying together with their leader in this site. I just tried to be as quiet as possible, and slowly take in the place. That was quite enough sightseeing for the day, so I tried to take another route back to Damascus Hostel. This is definitely one of the most fun things about Damascus – although it’s so small, there are so many nooks and crannies, you can always take a different way back, see different things, and end up in the same place anyway. In any case, I ended up in a cheapish cafe, and tried a local dish, Maqloobeh, which is a tasty lamb and aubergine dish, costing 150 SP. Finally, I got back to the hostel, took my stuff, hopped into a cab that took me to Baremkeh bus station (50 SP), before getting onto the airport bus (50 SP), which made the 30 mins journey to the airport. The bus was a little hard to find – it was a nondescript white bus, but they had a guy dressed like a pilot waiting for people to board the bus. Syria is a really nice place to visit. There are some countries in the Middle East which are quite harrowing to visit if you are a single girl. Syria is not one of them. I felt really welcome, safe, and people were generally very friendly and helpful. Despite all the troubles associated with visiting it, e.g. getting a visa, it’s definitely worth a visit!